, a late venerable and pious divine of the church of England, was born at Lowick in Northumberland, July 30, 1726. His father was Morgan Jones, a Welsh gentleman, a descendant of Colonel Jones (but of very different principles) who married a sister of Oliver Cromwell. His mother was Sarah, the daughter of the Rev. Mr. Lettin, of Lowick. He was remarkable from his childhood for unwearied industry and ingmium versatile. As soon as he was of the proper age, he was admitted, on the nomination of the duke of Dorset, a scholar at the Charterhouse, where he made a rapid progress in Greek and Latin, and laid the foundation of that knowledge which has since given him a distinguished name in the Christian world. His turn for philosophical studies soon began to shew itself; for meeting, when at the Charter- house, with Zachary Williams, author of a magnetical theory, which is now lost, he copied some of his tables and calculations, was shewn the internal construction of his instrument for finding the variation of the compass in all parts of the world; and saw all the diagrams by which his whole theory was demonstrated and explained. At this school, too, he commenced an acquaintance with the late earl of Liverpool, which was farther cultivated at the university, where they were of the same college, and continued to the last, notwithstanding the great difference in their future destination, to entertain a respect for each other. | When about eighteen years of age, he left the school, and went to University college, Oxford, on a Charterhouse exhibition. 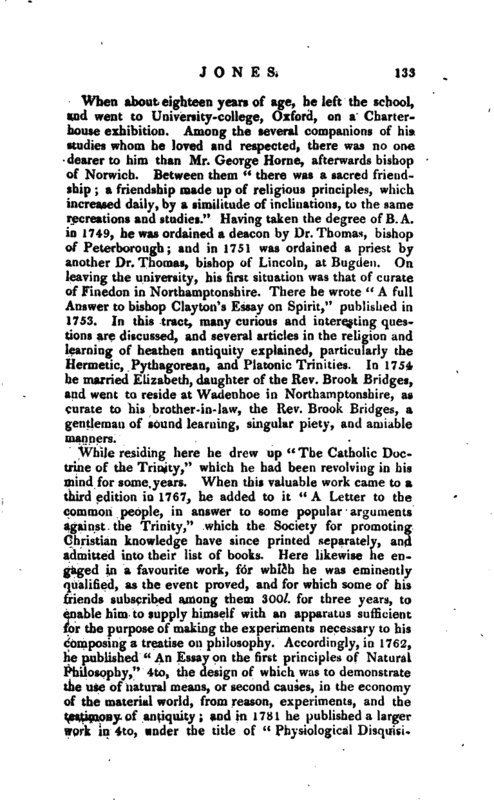 Among the several companions of his studies whom he loved and respected, there was no one dearer to him than Mr. George Home, afterwards bishop of Norwich. Between them “there was a sacred friendship a friendship made up of religious principles, which increased daily, by a similitude of inclinations, to the same recreations and studies.” Having taken the degree of B. A. in 1749, he was ordained a deacon by Dr. Thomas, bishop of Peterborough; and in 1751 was ordained a priest by another Dr. Thomas, bishop of Lincoln, at Bugden. On leaving the university, his first situation was that of curate of Finedon in Northamptonshire. There he wrote “A full Answer to bishop Clayton’s Essay on Spirit,” published in 1753. In this tract, many curious and interesting questions are discussed, and several articles in the religion and learning of heathen antiquity explained, particularly the Hermetic, Pythagorean, and Platonic Trinities. In 1754 he married Elizabeth, daughter of the Rev. Brook Bridges, and went to reside at Wadenhoe in Northamptonshire, as curate to his brother-in-law, the Rev. Brook Bridges, a gentleman of sound learning, singular piety, and amiable manners. While residing here he drew up “The Catholic Doctrine of the Trinity,” which he had been revolving in his mind for some years. When this valuable work came to a third edition in 1767, he added to it “A Letter to the common people, in answer to some popular arguments against the Trinity,” which the Society for promoting Christian knowledge have since printed separately, and admitted into their list of books. Here likewise he engaged in a favourite work, for which he was eminently qualified, as the event proved, and for which some of his friends subscribed among them 300l. for three years, to enable him to supply himself with an apparatus sufficient for the purpose of making the experiments necessary to his composing a treatise on philosophy. Accordingly, in 1762, he published “An Essay on the first principles of Natural Philosophy,” 4to, the design of which was to demonstrate the use of natural means, or second causes, in the economy of the material world, from reason, experiments, and the testimony of antiquity; and in 1781 he published a larger work in 4to, under the title of “Physiological DisquisU | tions, or Discourses on the Natural Philosophy of the Elements.” As it was ever his study to make philosophy the handmaid of religion, he has in this work embraced every opportunity of employing natural knowledge in the illustracion of divine truth and the advancement of virtue. "When the first volume was published, the late earl of Bute, the patron of learning ant 4 learned men, was so satisfied with it, that he desired the author not to be intimidated through fear of expence from pursuing his philosophical studies, and likewise commissioned him to direct Mr. Adams, the mathematical instrument maker, to supply him with such instruments as he might want for making experiments, and put them to his account. His lordship also handsomely offered him the use of any books he naight have occasion for. Mr. Jones’s work on the Trinity having procured him much reputation, archbishop Seeker presented him, first to the vicarage of Bethersden in Kent in 1764, and soon after to the more valuable rectory of Pluck ley in the same county, as some reward for his able defence of that important doctrine. The income he derived from his vicarage riot being equal to what he expected, it was thought expedient by his friends, that he should eke out Ins slender pittance by taking a few pupils; and having undertaken the tuition of two young gentlemen, he continued the practice for many years after he removed to Pluckley. In 1766 he preached the “Visitation Sermon” before archbishop Seeker at Ashford, greatly to the satisfaction of his grace and the whole audience. 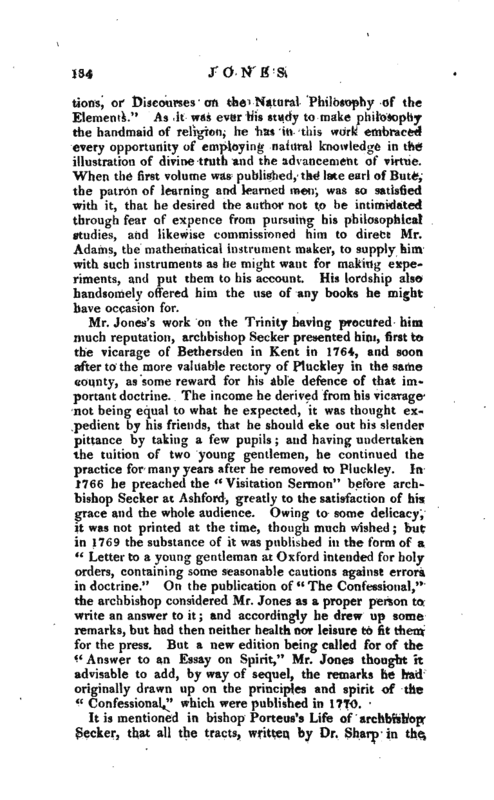 Owing to some delicacy, it was not printed at the time, though much wished but in 1769 the substance of it was published in the form of a “Letter to a young gentleman at Oxford intended for holy orders, containing some seasonable cautions against errors in doctrine.” On the publication of “The Confessional,” the archbishop considered Mr. Jones as a proper person to write an answer to it; and accordingly he drew up some remarks, but had then neither health nor leisure to fit them for the press. 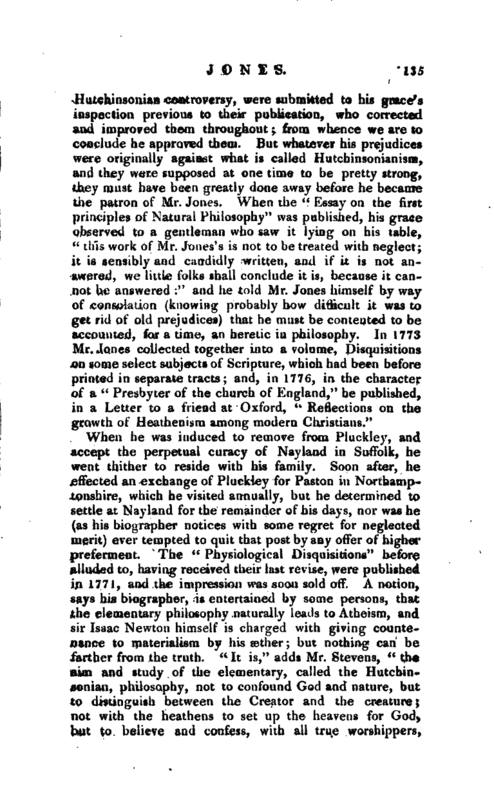 But a new edition being called for of the “Answer to an Essay on Spirit,” Mr. Jones thought it advisable to add, by way of sequel, the remarks he had originally drawn up on the principles and spirit of the “Confessional,” which were published in 1770. When he was induced to remove from Pluckley, and accept the perpetual curacy of Nayland in Suffolk, he went thither to reside with his family. Soon after, he effected an exchange of Pluckley for Paston in Northamptonshire, which he visited annually, but he determined to settle at Nayland for the remainder of his days, nor was he (as his biographer notices with some regret for neglected merit) ever tempted to quit that post by any offer of higher preferment. The “Physiological Disquisitions” before alluded to, having received their last revise, were published in 1771, and the impression was soon sold off. A notion, says his biographer, is entertained by some persons, that the elementary philosophy naturally leads to Atheism,' and sir Isaac Newton himself is charged with giving countenance to materialism by his aether; but nothing can be farther from the truth. “It is,” adds Mr. Stevens, “the aim and study of the elementary, called the Hutcliinsoniau, philosophy, not to confound God and nature, but to distinguish between the Creator and the creature; not with the heathens to set up the heavens for God, but to believe and confess, with all true worshippers, | ”that it is Jehovah who made the heavens." And td maintain that the operations in nature are carried on by the agency of the elements, which, experiment demonstrates, is no more excluding God from being the Creator of the world, than to maintain that motion once given to a watch will continue without the immediate application of the artist’s hand every moment to it, is asserting that the watch made itself. Let any one read the Physiological Disquisitions, and he will soon be convinced that North and South are not more opposite than Hutchinsonianism and materialism. 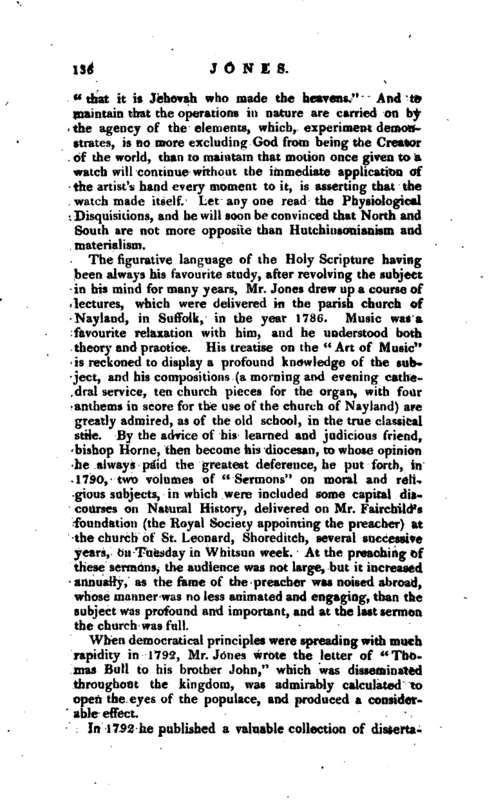 The figurative language of the Holy Scripture having been always his favourite study, after revolving the subject in his mind for many years, Mr. Jones drew up a course of lectures, which were delivered in the parish church of Nayland, in Suffolk, in the year 1786. Music was a, favourite relaxation with him, and he understpod both theory and practice. His treatise on the “Art of Music” is reckoned to display a profound knowledge of the subject, and his compositions (a morning and evening cathedral service, ten church pieces for the organ, with four anthems in score for the use of the church of Nayland) are greatly admired, as of the old school, in the true classical stile. 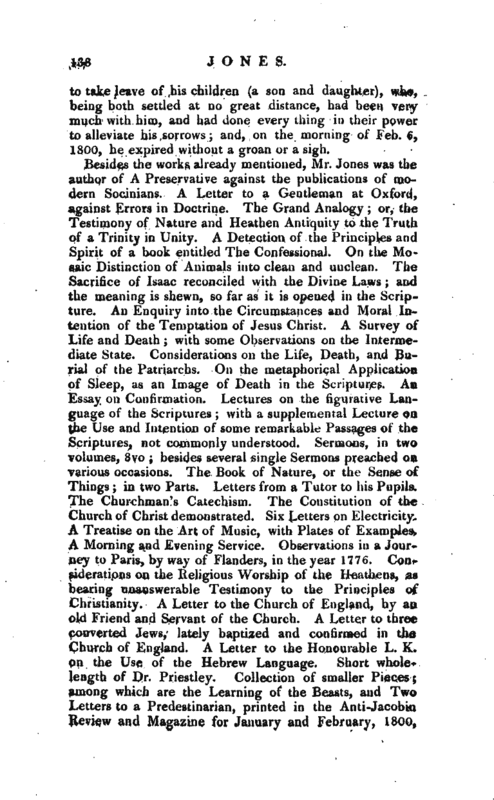 By the advice of his learned and judicious friend, bishop Home, then become his diocesan, to whose opinion he always paid the greatest deference, he put forth, in 1790, two volumes of “Sermons” on moral and religious subjects, in which were included some capital discourses on Natural History, delivered on Mr. Fairchild’s foundation (the Royal Society appointing the preacher) at the church of St. Leonard, Shoreditch, several successive years, on Tuesday in Whitsun week. At the preaching of these sermons, the audience was not large, but it increased annually, as the fame of the preacher was noised abroad, whose manner was no less animated and engaging, than the subject was profound and important, and at the last sermon the church was full. When democratical principles were spreading with much rapidity in 1792, Mr. Jones wrote the letter of “Thomas Bull to his brother John,” which was disseminated throughout the kingdom, was admirably calculated to open the eyes of the populace, and produced a considerable effect. In 1792 he published a valuable collection of | dissertations, extracts, &c. in defence of the church of England, under the title of “The Scholar armed against the Errors of the Time,” 2 vols. 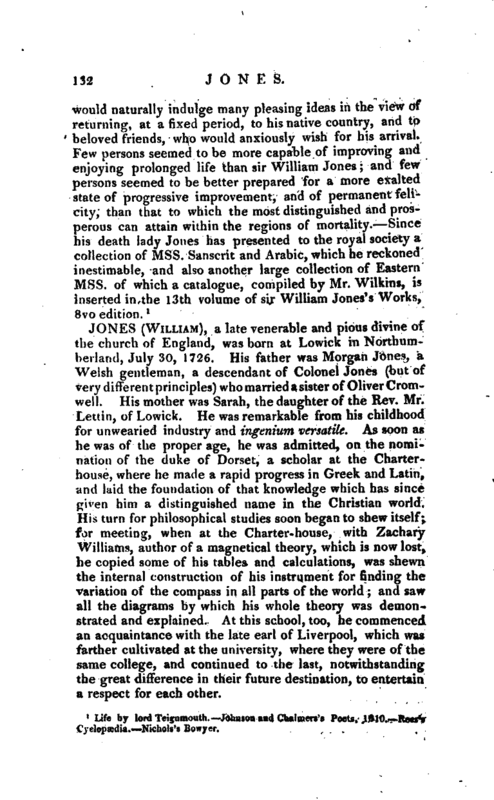 8vo; and on the death of bishop Home in 1792, Mr. Jones, out of affectionate regard to the memory of the venerable prelate, his dear friend and patron, undertook the task of recording his life, which was published in 1795, and the second edition in 1799, with a new preface, containing a concise but luminous exposition of the leading opinions entertained by Mr. Hutchinson on certain interesting points on theology and philosophy. In the autumn of 1798 he was presented by the archbishop of Canterbury to the sinecure rectory of Hollingbourn in Kent, benevolently intended as a convenient addition to his income, after the discontinuance of pupils; but in the following year he lost his wife, which was soon followed by another affliction, probably occasioned by the shock her death gave him, a paralytic attack which deprived him of the use of one side. In this infirm state of body, but with full exercise of his faculties, he lived several months. At length, he suddenly quitted his study, and retired to his chamber, from whence he came out no more, breaking off in the middle of a letter to a friend, which, after abrupt transition from the original subject, he left unfinished, with these remarkable words, the last of which are written particularly strong and steady. 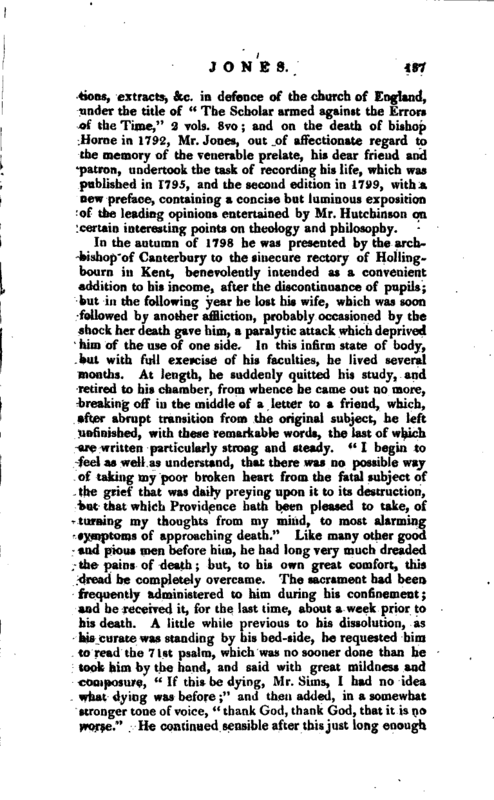 “I begin to feel as well as understand, that there was no possible way of taking my poor broken heart from the fatal subject of the grief that was daily preying upon it to its destruction, but that which Providence hath been pleased to take, of turning my thoughts from my mind, to most alarming symptoms of approaching death.” Like many other good and pious men before him, he had long very much dreaded the pains of death; but, to his own great comfort, this dread he completely overcame. The sacrament had been frequently administered to him during his confinement; and he received it, for the last time, about a week prior to his death. A little while previous to his dissolution, as his curate was standing by his bed-side, he requested him to read the 71st psalm, which was no sooner done than he took him by the hand, and said with great mildness and composure, “If this be dying, Mr. Sims, I had no idea what dying was before;” and then added, in a somewhat stronger tone of voice, “thank God, thank God, that it is n,o worse.” He continued sensible after this just long enough | to take leave of his children (a son and daughter), who, being both settled at no great distance, had been very much with him, and had done every thing in their power to alleviate his sorrows; and, on the morning of Feb. 6, 1800, be expired without a groan or a sigh. Life by Win. 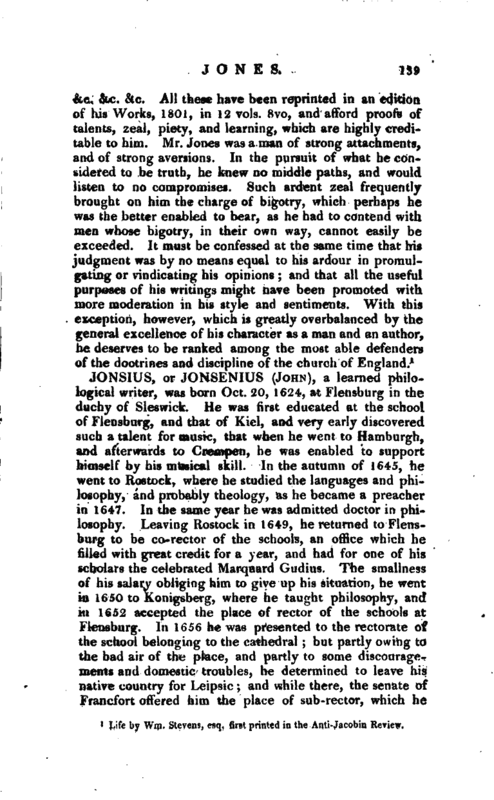 Stevens, esq, first printed in the Anti-Jacobin Review.